What happens when the immigration authorities in Phoenix say they will release Pastor Antonio if someone pays $5,000 bond and keeps him for future court visits? Somehow Antonio’s family pays the bond, Haroldo Nunes helps with the freeing process, and the Tadeos take him into their home. They have a finished basement for family and visitors. For Antonio it is a place to sleep, eat, and feel accepted until other arrangements can be made. That’s not all. A job is found quickly in one of the fields where help is needed picking pumpkins and potatoes. The new Tadeo routine includes making an early breakfast, packing a big lunch, driving to and from the fields, and making a late supper for Antonio. On Saturdays Antonio helps Raul with outdoor jobs around the house. On Sundays he worships at Salem and plays bass guitar, joining the Sunday School worship team. The Tadeos have an adopted son, or an angel visitor, for two weeks. Then he is contacted by his former boss in Florida who says, “We need you with your experience in construction work. Come. You have a permanent job with us.” He is gone. Not to be forgotten is the story this young minister from Guatemala is able to share during his visit. On his first visit to the U.S. he forgets his family and lives in sin. On one trip he almost dies while crossing the desert. On his third trip he runs out of food in Mexico City and turns to the Lord for help. 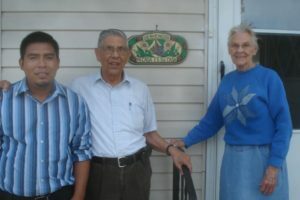 The Lord becomes real to him, he returns to his home in Guatemala and is reconciled with his family. He shares the gospel with friends, plants a church in his village, and becomes the pastor. He also faces persecution and poverty. Antonio and the Tadeos were both blessed by this God sent encounter.